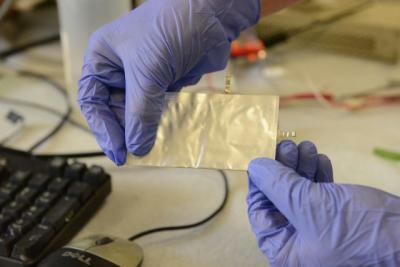 Researchers at Stanford University developed a new battery technology based on graphene and aluminum. The stanford team claims that their aluminum battery has a number of advantages over lithium: it's flexible, can be charged in a minute instead of hours and is very durable. it's also cheaper and non-reactive (meaning compromising it will not result in sparks like lithium batteries). The scientists used graphene foam (made by creating a metal foam, then catalyzing graphene formation on its surface) as cathode material and aluminum foil as the anode. The electrolyte the researchers used was a solution of aluminum trichloride dissolved in an organic solvent that also contained chlorine. While this granted better performance (7,500 cycles, much more than the 1,000 expected from a Li-ion battery), the voltage provided by an aluminum-ion battery is only about half of that what you'd get from a lithium-ion cell. Also, the overall power density (the amount of power you can store in a battery in relation to its size) is still insufficient.